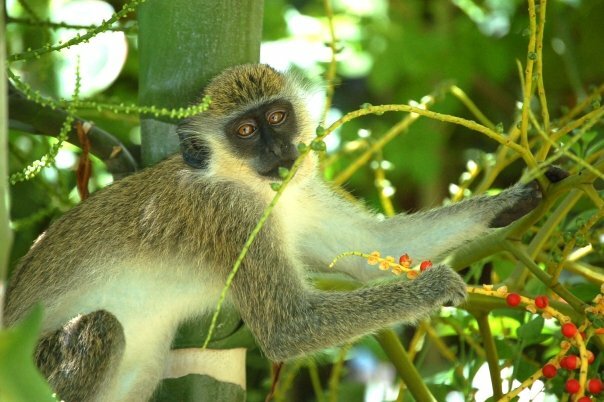 Vervet Monkeys were brought to St. Kitts by the French in the 1600s when ships involved in the slave trade traveled from to the Caribbean from West Africa. They usually have greenish brown coats with white undersides and white fur on their brows and cheeks. They have bluish skin on their abdomens. They currently outnumber the population of St. Kitts, some say 2 to 1. They are intelligent animals. Some people keep them as pets. Others consider them pests because of their wanton destruction of crops on the island. Photo by Dillet Isaac copyright 2008.